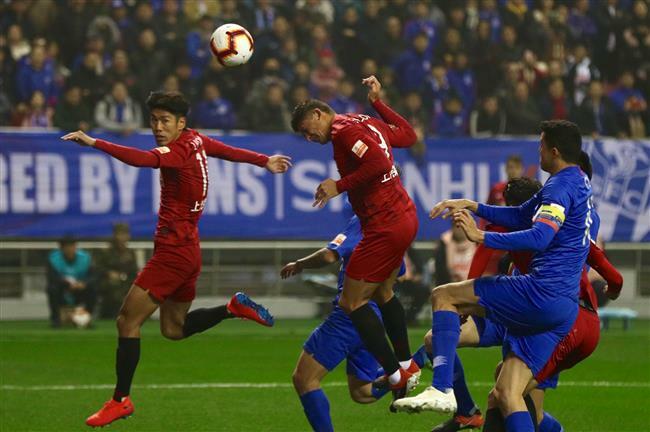 Shanghai SIPG beat city rival Greenland Shenhua 4-0 in their first round Chinese Super League derby match at Hongkou Football Stadium on Friday. Shanghai SIPG started their Chinese Super League title defence with a 4-0 victory over city rival Greenland Shenhua during their first-round clash at Hongkou Football Stadium on Friday. The four goals were scored by four different players, despite the absence of captain Hulk. Shenhua had to play one man short in the last 20 minutes after the send-off of defender Bai Jiajun. "We played a fantastic match," SIPG manager Vitor Pereira said. "I'm happy with my players, who are playing at a very high level. It will be very difficult for our future opponents if we can keep playing like this." Shenhua lost all the last four derby matches in the past two years. It seemed they had a chance to challenge the city rival this year as SIPG captain Hulk had to miss the opening match due to a thigh injury. He was replaced by Uzbekistan midfielder Odil Ahmedov. Despite being the visitors, the defending champions picked up form quickly, striking a series of attempts at the start of the match. Last year's league second top scorer Odion Ighalo was trying to fit into his new team as quickly as possible, and he only got his first touch of the ball 12 minutes after kick-off. Shenhua managed to add more pressure to SIPG's defense in the latter part of the first half. Ighalo had one of the hosts' best chances in the 40th when he received a pass from Fredy Guarin in SIPG's small box, but he couldn't convert the attempt into a goal. SIPG's first goal came in injury time of the first half when defender Cai Huikang scored with a header during SIPG's freekick attack. The goal was questioned by Shenhua players before VAR review confirmed that the ball had completely passed the goal line. Shenhua almost scored an equalizer in the 63rd, but the goal was ruled invalid due to a handball foul by Shenhua's Gao Di. SIPG didn't give Shenhua much time to recover from the invalid goal and doubled the lead just one minute later. Elkeson's shot was blocked by Shenhua goalie Li Shuai. SIPG striker Lu Wenjun stepped up to change the score to 2-0. Shenhua's chances of coming back became even slimmer when defender Bai Jiajun received his second yellow card in the 71st, leaving the hosts playing with one man short. SIPG's third goal came in the 78th. Oscar lead a round of strike before passing the ball to Lu Wenjun in Shenhua's box. Lu's shot hit Shenhua's post, and the ball fell into the path of Oscar, who fired the ball into the back of the net. The hosts then lost their concentration. In the 88th, SIPG's Ahmedov charged all the way from the midfield to Shenhua's box in a counter attack and sealed the score at 4-0. Disappointed Shenhua fans were calling out the name of Shenhua's former local manager Wu Jingui to express their depression. "Both teams had chances to score in the first half," Shenhua's new Spanish manager Quique Sanchez Flores said after the match. "But we were weaker in seizing opportunities in the second half. The team is still immature and needs to improve in details." SIPG, on the other hand, had a good start for the new season as the team just won the CFA Super Cup title, beating Beijing' Guo'an in Suzhou a week ago. "The team has the maturity to play in different games. We are in good playing spirit," said Pereira. "Derby matches are difficult and we are happy to have performance like this," SIPG's Oscar said after the match. When asked whether Hulk's absence affected the team, Oscar said players on the pitch are the ones that matter. "We are a team. We have high level foreign players, but our Chinese players are also excellent," said the Brazilian.